For more information or to purchase or sell items please contact us. Figures are entered by a third party. The Gold Sovereign was first issued in 1489 for Henry VII of England. While the coin typically had a nominal value of one pound sterling or 20 shillings, the Sovereign was primarily an official piece of bullion with no mark of value anywhere on the coin itself. The name "sovereign" comes from its majestic and impressive size and the portraiture. The earliest showed the King facing, seated on a throne, while the reverse shows the Royal coat of arms on a shield surrounded by a Tudor double rose. The Krugerrand was first minted in 1967 in order to help market South African gold. The coins have legal tender status in South Africa but are not actually used as currency. The Krugerrand was the first bullion coin that could be used as legal tender at the market value of its face gold content. Earlier gold coins such as the gold sovereign had a tender value in currency engraved on their face which could differ significantly from their market value. The Krugerrand was the first gold coin to contain precisely one ounce of fine gold and was intended to provide a vehicle for the private ownership of gold. Since the Krugerrand is minted from gold alloy that is 91.67 percent pure (22 karats), the actual weight of a "one ounce" coin is 1.0909 troy ounces (33.93 g), to provide one troy ounce of pure gold. The remainder of the coin's mass is made up of copper (2.826 grams), giving the Krugerrand a more orange appearance than silver-alloyed gold coins. 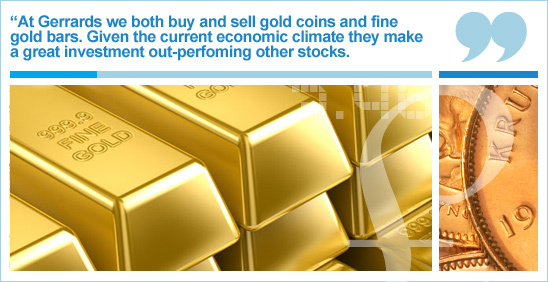 Alloys are used to make gold coins harder and more durable, so they can resist scratches and dents during handling. The 2016 Britannia 1 oz Gold Bullion Coin contains one troy ounce of 999.9 fine gold (24 carat). Britannia is one of the world’s oldest coin icons and this classic design is recognised and respected across the world as a symbol of beauty, reliability and strength. In a new development for 2016, this coin now features the fifth definitive coinage portrait of Her Majesty The Queen. This coin is VAT free and Capital Gains Tax exempt. The figure of a woman, called Britannia, has long been a symbol of national pride. She first appeared on British coins in the seventeenth century and ha subsequently graced the coinage of every monarch to the present day. However, she made her debut on the coins of the Romans and has, from Tudor times, beautifully symbolised an empire based on maritime power. Great and free - she has fascinated artists and sculptors throughout her history and remains a favourite icon for British stamps, medals and coins. By the time the Queen came to the throne in 1952, Britannia had assumed the status of an immortal having featured on British coinage for almost 300 years. In 1987 she was elevated to the new gold bullion coinage and today appears on the highest value coins of the realm.